It’s hard to convey the sheer magic of Bruce Springsteen to someone who only knows Born in the USA, Dancing in the Dark and perhaps a handful of other songs they tend to play to death on the radio, without mentioning the live performances. Sure, other bands play live (some better than others), but to see Bruce Springsteen and the E Street Band performing on stage is an event like none other, and sure to win over even the most sceptical music lovers out there. It’s also hard to review a Springsteen concert without a generous helping of superlatives. Even in Nijmegen’s Goffertpark in the Netherlands, where it smells of beer, sweat and urine because the improvised festival grounds can hardly take the 60.000 people, let along cater to their needs (waiting in line for half an hour for food, or ten for a drink, is no exception this Saturday, sadly enough). Everyone is here for the exact same thing, and almost everyone knows exactly what to expect. First off, though, it’s time for Jamie N Commons and his band to shine. Part Cash, part Dylan, part generic blues rock guitar hero, Commons is quickly making a name for himself, and here he gets a very royal half hour to shine. Which, to be fair, is very hard to do when you’re performing before a crowd eagerly awaiting a living legend like Springsteen. Commons does manage to come across as a capable musician, if rather a bland performer, but his bluesy rock music is somewhat lost on the crowd today, I’m afraid. It’s never bad what the man does on stage, but his music might be more suited for a sweaty blues club than on the big stage today. The Black Crowes, on the other hand, is an entirely different matter. The band looks as if they’ve just stepped out of a Woodstock documentary and onto the stage, and that stage fits them like a glove. They’re not wrapping the audience around their finger (which, again, is nigh on impossible when you’re opening for Springsteen), but they give away a very tight performance, and the apparent enthusiasm they show is commendable, with songs like Hotel Illness and Remedy demanding the attention of the ever growing crowd. At seven thirty, however, it’s an entirely different ball game, when sixty thousand pairs of eyes are fixed on the stage, when a lone, small figure walks on with a guitar and a mouth organ, and starts playing a captivating rendition of The Ghost of Tom Joad. 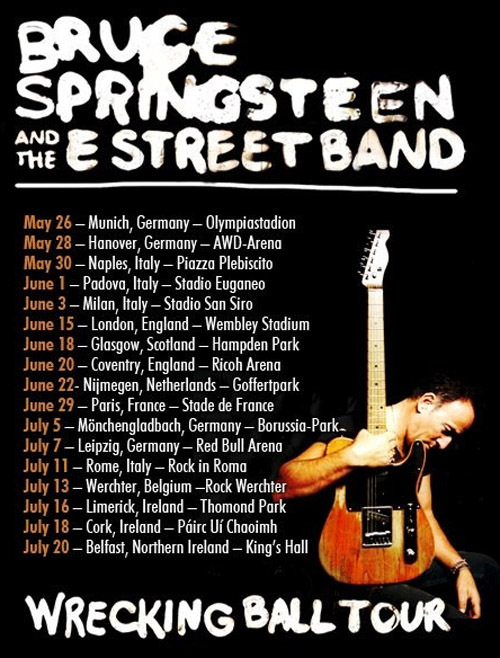 And when the music ends and Springsteen is joined by the E Street Band and a host of background singers and an entire horn section (amongst which Jake Clemons, the nephew of the late saxophonist Clarence “Big Man” Clemons), you know you’re in for the night of your life. Like virtually every single Springsteen concert can, and most likely will be. Seeing and hearing Springsteen and his band performing can feel like a cathartic experience. The set list changes from night to night, making every performance an pretty capsulated and singular experience. Springsteen himself oozes enthusiasm and sheer enjoyment when he is on stage, and the E Street band is one of the most amazingly tight and versatile bands like you’re likely to see in your lifetime. At no other point is this more apparent than when Bruce goes up to the crowd to collect signs with requests written on them. Some of the requested songs are rarely played live, like tonight’s Sherry Darling and the even more obscure So Young and in Love from the 1998 compilation album Tracks, and it’s testament to how versatile and downright amazing this band is that they’re able to just dive into any song from Bruce’s incredibly extensive discography on a whim. During the course of the set, Bruce and his band work their way through a whopping thirty-four songs before the curtain finally falls, and the evening is filled with old classics, new songs, a few surprises in between, and, perhaps most importantly, an immense sense of fun. It’s one giant party, with sixty thousand people singing and shouting along from the tops of their lungs. Old fan favourites like Growin’ Up or Thunder Road are interspersed by newer material from albums like The Rising or Wrecking Ball (hey, it isn’t called the Wrecking Ball tour for nothing). To make the evening even more special, we are treated to a back-to-back, integral performance of the entire Darkness on the Edge of Town album halfway through the regular set, with a particularly electrified version of Badlands kicking things off. Also worth a mention is the beautiful version of Racing in the Street, or Nils Lofgren’s amazing guitar solo at the end of Prove it all Night, with him whirling over the podium and playing the guitar with his teeth. Truly electrifying, amazing stuff. After Darkness of the End of Town, the band shifts gear straight into Pay Me My Money Down, which the band draws out into an extended party, with band almost eye to eye with the public on the front platform, and the background singers wearing large, colourful umbrellas, giving the song an even more New Orleans-like vibe. Of course, the biggest hits have not been forgotten here, and the Dutch crowd will not go home without hearing Born in the USA, Born to Run or Dancing in the Dark, all of them in the encore section tonight. And yes, Bruce, interacting quite a bit with the front-row audience tonight, actually pulls a woman on stage to dance with during Dancing in the Dark. During Tenth Avenue Freeze-Out, with a photo collage of the late Clarence Clemons and Danny Federici being projected on the big screen on the stage, the heavens finally open and the drizzle we have seen coming and going all day turns into pouring rain at last. It doesn’t matter one bit, though. ‘I could go home, but it’s not raining hard enough,’ yells Bruce, and the band dives head first into a cover version of Twist and Shout. With ‘it’s still not raining hard enough!’ we are also treated to Shout Bamalama, originally by Otis Redding, before finally saying goodbye. Backed by a truly masterful band, the music scene hardly has entertainers quite like Bruce Springsteen, if any. With the enthusiasm and the vigour of a young man rather than a 63 year old, shows virtually every single band out there how you play a crowd and give them their money’s worth. You can watch Springsteen for three and a half hours tonight, go to another concert next week and have an entirely different – but equally excellent – experience. For three and a half hours, you will be able to forget your every-day sorrows and the pouring rain, and have the best night of your life. 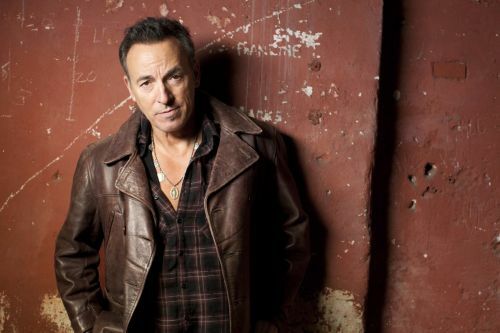 They don’t call Springsteen The Boss for nothing. This entry was posted in RP and tagged Bruce Springsteen, E Street Band, Goffertpark Nijmegen, Jamie N Commons, Live review, The Black Crowes, Wrecking Ball Tour. Bookmark the permalink.